Royal Mail has cleared its first hurdle as a public company. But deep-seated challenges remain, and the UK postal firm’s current market value looks too rich. Superficially, decent interim earnings on Nov. 27 endorse the view the UK postal firm’s recent flotation was woefully underpriced. Shares have now risen two-thirds in the six weeks since Royal Mail was privatised. Indeed, the immediate backdrop is moderately encouraging. While a steady decline in letter volumes continues apace, parcel delivery, helped by the rise of online shopping, is providing compensation. Royal Mail is also rising to the challenge of stiffer competition in parcels. The company is controlling its costs – no easy task given its obligation to deliver all across the UK on a single tariff. Even though people costs – 67 percent of the total – rose 3 percent, ongoing operating costs barely changed in the six months. Still, getting a clear picture of a business in transformation is tricky. Headline pretax profit, at 1.58 billion pounds, was flattered by a one-off pension adjustment. Operating profit margins nearly doubled to 6.3 percent, but this too was lifted by tax credits and lighter depreciation and restructuring costs. A cleaner figure might be closer to 4 percent. If all goes well, these operating margins could eventually hit 8 to 9 percent. But margin gains will get progressively harder to achieve and more dependent on growing revenue. In the half-year to Sept. 29, revenue grew just 2 percent. This rate could pick up, but probably not by a huge amount. Investors, meanwhile, need the company to stay on the straight and narrow for many years because so much of the equity value hinges on shareholder payouts. The current inflated share price only really makes sense if you can assume strong growth in earnings, and dividends that rise in step. Sadly, the company is too constrained to make that a sensible assumption. Although the threat of industrial action seems to have receded, a debilitating strike remains a real possibility. Rivals are pushing a tax case that could make Royal Mail delivery less competitive. Since the risks facing Royal Mail are still very real, the current share price looks unrealistically high. 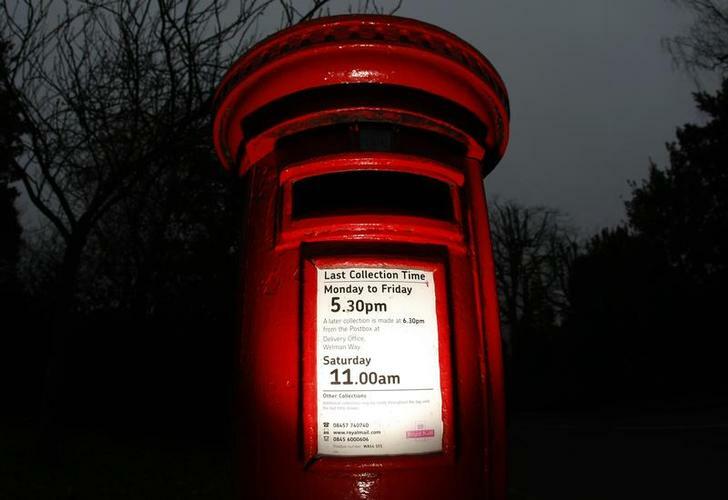 A post box is seen near Manchester, northern England. Shares in Royal Mail rose on Nov. 27, after the British postal group reported its first set of results as a public company. The group made a pretax profit of 1.58 billion pounds in the six months to Sept. 29, up from 113 million pounds in the same period a year earlier. The bulk of the rise was due to a non-cash accounting gain arising from changes to the terms of employee pension provisions. EBITDA rose 19 percent to 483 million pounds, while revenue grew 2 percent to 4.52 billion pounds. Royal Mail confirmed plans to pay a dividend of 133 million pounds – or 13.3 pence per share – for the second half of its financial year. That is roughly two-thirds of a notional full-year payout.